My current favorite summer drink is homemade chai with coffee cubes. The combination of the sweet chai and the strong coffee makes for a very dynamic drinking experience. 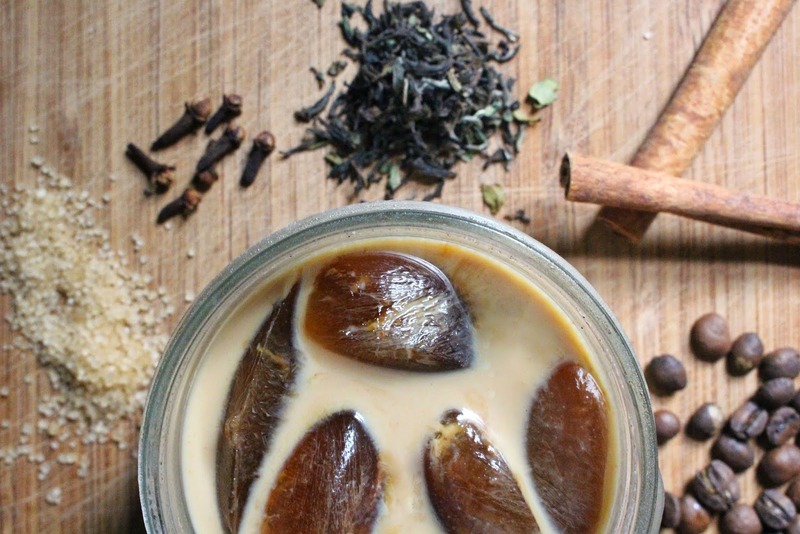 At first, the creamy chai is the overwhelming flavor. Slowly, the coffee cubes melt into the milky tea, mellowing out the sweetness and bringing out a new flavor combination. This particular recipe combines iced caramel chai and coffee ice cubes made with Counter Culture's Nueva Llusta. I discovered the chai recipe earlier this year on Not Without Salt and savored every warm sip of it during the Winter months. So glad to have found a way to enjoy it during the hot Atlanta summer! Add the raw sugar to a small saucepan and set over medium high heat. I always use a secondhand saucepan for this recipe as caramelizing sugar has ruined one of my nice pots in the past. Caramelize the sugar by letting it melt evenly until it's a dark caramel color. Make sure to watch it closely during this stage as burning the caramel even slightly will give the chai a bitter, harsh flavor rather than a lingering sweetness. Once the sugar has caramelized, remove the pan from heat and slowly pour the milk into the saucepan. This will harden the caramel and stop the caramelization process. Next, heat the pan over medium low heat while adding all of the ingredients except the tea, stirring occasionally as the caramel melts into the milk. Once the caramel has melted fully, increase the temperature to medium high, stirring often. Once it is just about boiling, remove the mix from the heat and let the spices steep in the hot milk for twenty minutes. Return the pan to medium high heat until almost boiling, remove from heat and add the tea. Allow the tea to steep for five minutes. Strain the chai through a fine mess strainer into a lidded container. I use a 16 oz mason jar. If you are making iced chai with coffee cubes, leave the chai to cool in the refrigerator until cold. Otherwise, it is ready to enjoy hot! To make the coffee cubes, simply make a cup of your favorite coffee and freeze in an ice cube tray. Once the coffee is frozen and the chai has cooled, combine the two and enjoy! whoa! it does sound and look so refreshing!